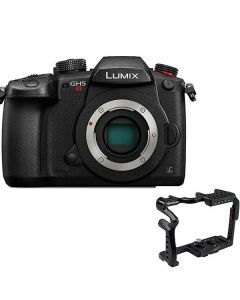 This bundle pairs the stunning GH5S with the Movcam cage specifically designed for the GH5 and GH5S. The cage enables form-fitting protection for your camera and supports mounting accessories without stressing your camera's body. The LUMIX GH5S achieves the highest ever sensitivity and best image quality in LUMIX history. This is realized by combining the newly developed high sensitivity sensor with Dual Native ISO technology and the latest Venus Engine. Dual Native ISO is a s revolutionary technology featured on Panasonic's professional video cameras and offers the advantages of very high sensitivity while keeping noise levels low. Usually, with a conventional single native ISO, noise levels rise when sensitivity is increased. However, the newly developed image sensor implements dual circuits able to switch to high native sensitivity before gain processing. This means you can achieve beautiful footage with suppressed noise in low lit situations. The original LUMIX GH5 made it possible to record 4k/60p and 4k/50p video on a DLSM camera. Now, to greatly extend your creative possibilities, the LUMIX GH5S takes this even further and for the first time ever, includes 4,096 x 2,160 Cinema 4K 60p/50p video recording. Moreover, there no limit to the recording time, not even when shooting FHD or 4K video. With internal recording of video in 4:2:2 10bit and an impressive 10.2 megapixel Digital Live MOS Sensor backed by a Venus Engine that handles digital signals at ultra high speed, this camera's image quality per frame is dramatically improved with faithful colour reproduction and grading. High bit rate recording at 400Mbps, optimal for nonlinear editing, is also made possible. The LUMIX GH5S complies with 4K HDR video. The HDR (High Dynamic Range) is a mode to reproduce both bright parts and dark parts of an image, making the subject appear just as the human eye perceives it. The camera records video with a designated gamma curve compatible with ITU-R BT.2100, and you can now choose Hybrid Log Gamma (HLG) in Photo Style. A low bit-rate recording mode 4K HEVC for HLG is also available, which enables playback on AV equipment compatible with the HEVC compression format, such as Panasonic 4K HDR TVs. To elevate video expressivity even further, a variety of effects are available on the LUMIX GH5S. The VFR (Variable Frame Rate) lets users record overcranked / undercranked video C4K/4K (60fps, maximum 2.5x slower) and FHD (240fps, maximum 10x slower). The minimum frame rate for quick motion effects video is 2fps. Tough enough to withstand even heavy field use, the main structure is composed of a magnesium alloy die cast front and rear frame. Secure construction and a sealing for every joint, dial and button make the LUMIX GH5S not only splash and dust-proof but also freeze-proof down to -10 degrees C (14 degrees F). When shooting video, this adaptor allows you to record high grade stereo sound to the camera directly through a high spec XLR microphone. High-Res recording (at 96kHz/24bit) is also possible when shooting 4K video. Selecting between separate MIC / LINE / CONDENSER MICROPHONES is also possible using the input switches on the control panel. By using two batteries, one in the camera and the other in the grip, the DMW-BGGH5 extends battery life for longer shooting times. Robust as well as splash / dust and freeze proof the grip is easy to grasp even when shooting vertically, complementing the LUMIX GH5S design. The LUMIX GH5S integrates Bluetooth 4.2 (Bluetooth Low Energy) and Wi-Fi connectivity for more flexible shooting, smoother remote control and faster image sharing with minimal power consumption. Connected to a smartphone or tablet, you can shoot, browse and share images remotely, as well as adding a GPS geotag. Furthermore, on a multiple GH5S camera shoot, your main camera settings can be transmitted wirelessly to other GH5S units. In addition to standard 2.4GHz Wi-Fi, this camera connects to tablets and other devices by the more secure, more stable and faster 5GHz(IEEE802.11ac).